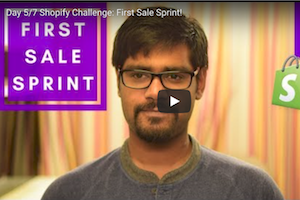 Day 5/7 Shopify Challenge: First Sale Sprint! Welcome to Day #5 of the First Sale Sprint Challenge! First things first, if you haven’t started with Shopify, you’ll want to by clicking here. This week we’re building a profitable Shopify store from the ground up! Only it’s not our store. We are building this store for one of our students. Today we cover the first steps you’ll need to take in order to be successful with Shopify and drop shipping. We’re not even 7 days into the First Sale Sprint and Nigel’s store (UrbanSigma.com) has already gotten its first sale! In fact this not only puts Nigel at a profit already, but it occured within 5 hours of his very first Facebook ads being live. Tremendous start and a great indication of things to come. Once your first sales begin to come in, you’ll need to begin fulfilling the orders via AliExpress drop-shipping, ZeroUp or Oberlo. You’ll also need to start trimming up your ad sets – scaling what’s converting, and pausing what’s not. That all said, let’s take a look at the Facebook Advertising Stats for Nigel’s store. When advertising your Shopify store on Facebook, there are several metrics you can track. Many of which are not that important to the long-term success for your business. You should now see a tab toward the top center of your screen that says “Columns: Performance” with a drop down arrow…Click it. On the right side of the screen that appears, you’ll notice 14 columns already selected. Click the X next to each of the metrics that we have not listed above. Use the search feature that’s also on that new screen to search for and add any metrics you don’t see listed. You should have 16 columns of custom metrics discplaying once you have done this. It may seem like a lot, but these particular metrics allow you to make some powerful informed decisions regarding your business. That’ll do it for Day 5 of the First Sale Sprint – Well done! P.P.S. Click here for Day 6! « Day 4/7 Shopify Challenge: First Sale Sprint!